CPPF’s Sabrina Stein and Renata Segura produced a report on prevention in the fields of Disaster Risk Reduction, Nuclear Nonproliferation, and Public Health. The paper focuses on "lessons learned" from each of these fields, which could prove beneficial for the prevention agenda. As the UN system focuses on the SG’s reforms and member states focus their attention on negotiations concerning the future of the UN architecture, there is a danger that discussions on prevention and sustaining peace will be put on the backburner and lose much-needed momentum. With this in mind, this research hopes to continue the discussions on prevention and sustaining peace by bringing a set of different perspectives from these three fields. The report argues that examining other fields that work with prevention at their core might help bring new ideas to the prevention agenda and contribute to the discussion on how to make prevention a concrete and actionable reality for both the UN and member states. 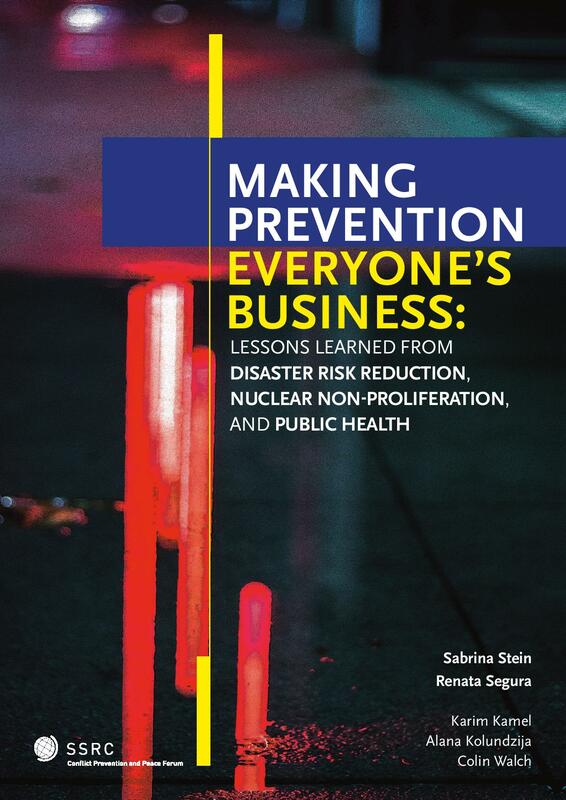 Making Prevention Everyone’s Business: Lessons Learned from Disaster Risk Reduction, Nuclear Nonproliferation, and Public Health, Segura, Renata and Stein, Sabrina (June 2018).